Glance out the window of a speeding train. The landscape is never the same twice. That's the vibe behind Transit Dreams. This audiobook is a collection of short stories and vignettes. Some may make you laugh; others may make you think. They run the gamut from fantasy to comedy, from horror to cynicism, to just plain weird, and make all stops in between. All aboard. You're in for a ride. ©2013 Antonio Simon, Jr. (P)2015 Antonio Simon, Jr. 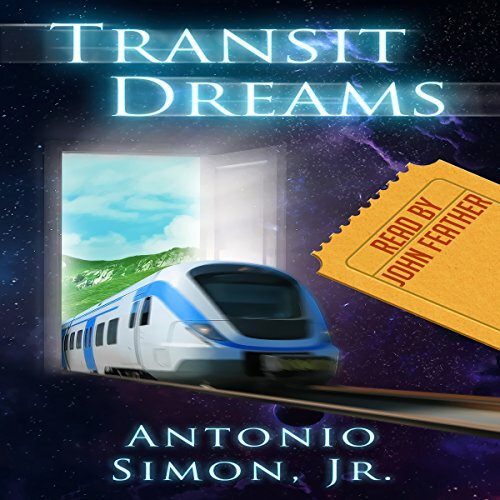 If you could sum up Transit Dreams in three words, what would they be? Each story is different, you never know what you're going to get but it's always good. The one set during the Cold War was fantastic and nerve-wracking! Have you listened to any of John Feather’s other performances before? How does this one compare? This is my first time listening to Mr. Feather. I enjoyed his performance very much. There was this one story, "Red Airwaves" that I liked the best because of how terrifying it was. But all of them are great. This is a great book! And Mr. Feather's performance was wonderful! Would you listen to Transit Dreams again? Why? Yes I would. This collection of stories is varied and entertaining enough to listen to again and again. The stories are so varied. There's something for everyone. What does John Feather bring to the story that you wouldn’t experience if you just read the book? Mr. Feather's voice is crisp, clear, and engaging. It shows that he has theatrical training. Yes. But the stories can be enjoyed in any order, in one sitting or with breaks in between. This was an enjoyable audiobook. Get aboard! Wonderful short stories! Yes! This is a collection of varied short stories, all of them wonderful. The book is a grab-bag mix of comedy, horror, and fantasy, like a train chugging along a varied landscape. Many of the stories are written in first person, so I would have to say that the narrator is my favorite character. This is my first time listening to John Feather. I can say that his performance was amazing. I enjoyed it a whole lot. He has excellent command of intonation, timing, and character. The story about the children acting up in the classroom was hilarious. This is a wonderful audiobook. Bravo to the author and narrator! This is an enjoyable collection of short stories: a Buick that kicks shopping carts into trees; a paranoid hermit on the eve of the Cuban Missile Crisis; a surreal account of what happens when an army missile base opens up next door to a small neighborhood airport. Each story is different, quirky, and memorable. Mr. Feather's experience as a professional character actor really shines in his narration. He takes a different approach with each short story, running the gamut from easygoing, to tense, to snarky and all stops in between. It's a stellar experience.